Two autumn moons persist with their common names long after the other moon names are forgotten among most people. They are the Harvest and the Hunters’ moons. These two moons persist in everyday culture because they both appear very large, reddish and for a long time in the night sky. More information on full moons can be found on Wikipedia. The Harvest Moon is the first full moon after the Autumnal Equinox. It can occur in September or October depending on when the first full moon happens. This low hanging moon looks bigger and brighter than others. It is usually tinted red. The Harvest full moon stays in the sky for a long period of time. It rises shortly after sunset and in the eastern sky opposite the sun. It rises only 25 minutes after sunset rather than the normal moon rising pattern. The normal moon rising pattern is 50 minutes later each night. So, the Harvest moon rises 25 minutes sooner than normal. And stays in the sky longer than normal for several nights. It stays visible near the horizon for three or four nights before and after the full moon. This provides farmers and gardeners with more time to harvest crops. Hence, the name “Harvest Moon”. This autumn moon signals, along with frosts, the end of the growing season. The nature-based holidays that focus on the growing season are celebrated around the autumnal equinox. Many peoples around the world celebrate the harvests with festivals and rituals. Here in the United States harvest symbols include cornucopias, gourds, winter squashes, and bundles of corn. Many people decorate their homes with these symbols. The autumn is also the time that many peoples remember their dead friends, relatives and ancestors. This moon received its name because animals have fattened up for the winter and its is a good time to hunt them for the winter food supply. 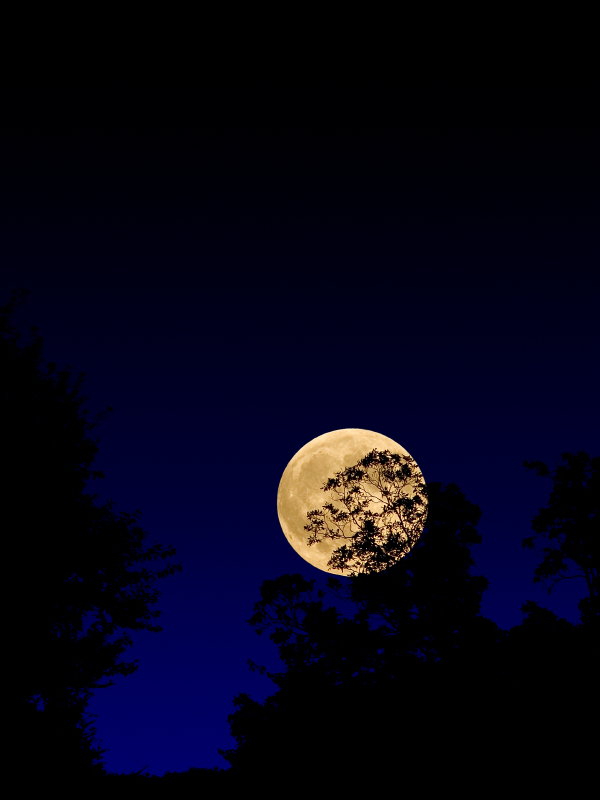 The Hunter’s Moon rises in the early evening soon after sunset. It travels slowly across the evening sky. The additional bright moonlight let’s hunter’s stalk prey later into the evening. Often the moon has a reddish tint. These moons don’t actually change size or color, they change behavior. The Harvest and Hunter’s moon are the same size and brightness as other moons. Why the moons appear so large and bright is due to a phenomena called “moon illusion”. When the moon appears close to the horizon (the line where sky and earth meet) it appears very large. This is the illusion. A low hanging moon is the same size as the moon when it is higher in the sky. A moon that hangs low in the sky near the horizon is actually farther away from the viewer than when it is higher. A low hanging moon just appears larger. There are several theories about why this happens but scientists haven’t decided which theory is true. These low hanging moons appear reddish. This is due to the moon shining through the low atmosphere of Earth. Smog, smoke, dust and other particles that hang in the air make the moons appear reddish. But these two illusions, both large size and reddish color, continue to give the two moons their specialness.